Hakotep's flying pyramid has been grounded, but the heroes must enter the ancient tomb to deactivate the fleet of smaller flying pyramids poised to attack cities across Osirion. Deep inside the Pyramid of the Sky Pharaoh, an untouched tomb from the heights of Ancient Osirion, the heroes face undying guardians woken from ageless sleep, culminating in a final battle with the reborn Sky Pharaoh Hakotep himself. Will the heroes defeat Hakotep and reunite the pieces of his sundered soul to send it into the Great Beyond, or will Osirion enter a new age under the rule of a mummified Pharaoh from the distant past? 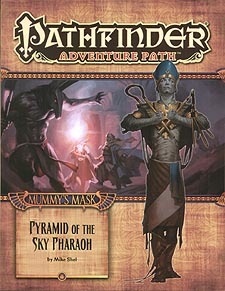 "Pyramid of the Sky Pharaoh," a Pathfinder adventure for 15th-level characters, by Mike Shel. A detailed look into the questions of the afterlife, judgement, and the nature of souls, by F Wesley Schneider. The exciting conclusion of "Shadow of the Sands" in the Pathfinder's Journal, by Amber E Scott. Five new monsters created by Tyler Beck, F Wesley Schneider, and Mike Shel.